We Interview Tenko Nikolov, CEO and Managing Partner at SiteGround. SiteGround is a successful hosting company with hundreds of employees. Located in Europe, its CEO, Tenko Nikolov, has been fixated on growing his brand by focused on success across the team and for their customers. It’s evident that SiteGround knows what they’re doing — and the photos tell a great story about a great company culture. Tenko has shared his experiences with us in the interview below. We highly recommend you read it to learn how this young CEO has made his company so incredibly successful. Join us every Friday at 9 am PST and be part of our live show, where you can ask WordPress tech questions, and abe part of the discussion. To see a list upcoming Saturday shows go to https://www.wp-tonic.com/blab/. Welcome to WP-Tonic Episode 191. 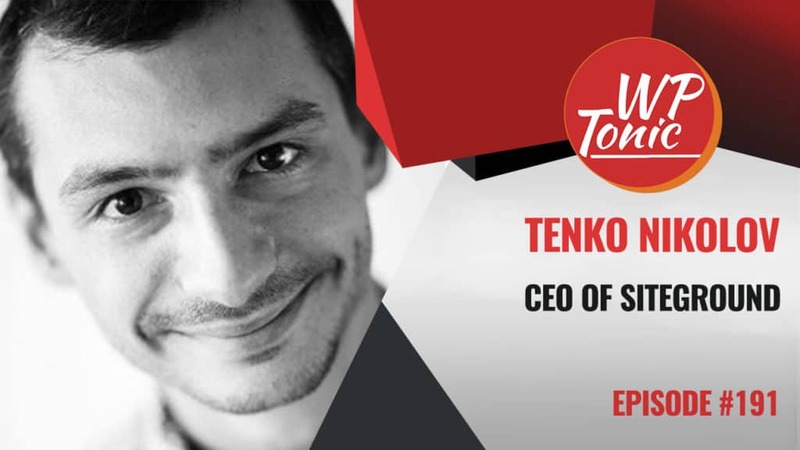 Today, we’ve got the immense pleasure of having us our guest Tenko Nikolov, the CEO of SiteGround. Before we get into today’s episode, I’d also like to introduce to you my co-host, Jonathan Denwood. And myself, I’m John Locke. We’ll jump right into it. How did you first get into technology? And I know that this is a really intriguing story because at first you were a law student and how did you come to work at SiteGround and what made you switch career paths in the first place Tenko? Oh! Hi John! Thanks for having me. So I got into technology, honestly, much before becoming a law student. Actually, I think my granddad gave me my first computer as a present. That was at the age of seven, I guess. And then, I was fascinated by it. I liked it. I spent all my time on the computer. And then the first payment I ever got in my life was for hacking into servers of a big American company, which I might not say. But that was at the age of thirteen, fourteen, I guess. The first payment I got was in the form of server online. So I have that for a couple of years, play with it, and was even more fascinated by what technology has given to you than by what everything internet related. When I became a student, actually two months before my first day as a student, I got my first job as a technical support in a big ISP here in Bulgaria and then as for SiteGround one thing led to another. After two years probably, one year and a half after, I was in between jobs, I was looking for a job as a technical support because I was good at that. I was liking it. And that’s how I found SiteGround. It was brand new company. It was just founded. I guess no more than I guess four, five employees, out of which two were support and I was the third support member. So there wasn’t any structure of the company. There wasn’t anything but there was good marketing. My current partner, who’s doing marketing. The company was growing with just five people. Even then, support was a big thing. We always believe that support was one of the most important aspects of our business. Helping people is what we’ve always strive for. I quickly became the technical support manager, which was the largest department in the company, which currently is the largest department in the company as well. Again, one thing led to another. Soon after that, I was the CEO of our company. That is a really interesting story. You truly have what we call a success story where basically you came in as support and you ended up being CEO. Was that your plan all along or how did that come about? How did you have that to happen? To be completely honest, I never imagined myself in that position. I was always a fan of the technical stuff and because I’m not a developer as a background, but I’m a technical person at the same time. And at the same time, I studied law, so I am good at other things besides being just geeky. So it turned out it’s a good combination for running a tech company. So I never dreamed about it. It was never my goal. It just happened. But I love it. Excellent. I’ve heard you said before that SiteGround is successful because it pays attention to three core values, which is outstanding support like you mentioned before. The support is still the largest department, but also the technological innovation and employee’s satisfaction. I want to ask you, what role does each of these play in the success of the company? To be honest, the role of those three is tremendous in what we have achieved. I don’t want to say which one is the most important but if I have to, I’d say employee happiness is the most important of all because if you can’t build a company that your employees love, how are you going to build the company that of this much you love? You have to start small, you have to have your employees believing in what you do. Believe that your better, know that you’re better and strive for making your company better. That leads to happy employees. Maybe, that it is one of the reasons that we have been voted employer no. 1, here in Bulgaria for the past few years. I think happy people are eager to do the best things in the world and those same happy people are eager to do technological innovation, which is a big part of what we do because we are a technological company, and if we don’t innovate, we’re just one of the lots of the company and the masses. And we don’t want to be that. We want to be different, we want to do everything ourselves. And throughout the years, we have innovated quite a lot of stuff. We were the first web host to do account isolation on shared posting, and then, we were the first to introduce AI monitoring that automatically fixed our servers. Then we were among the first to embrace the Linux container technology and started building on top of it. We are now doing a lot of stuff with AI, which is great. I love AI. That innovation fortunately requires. I think, outstanding support because if you have a service like everybody else, then you can just deal with employees from other companies and just support that service. But if you innovate, if you create something new, then you have to have highly trained people to be able to help your customers. As I said in the beginning, it’s always been very, very important for us to be able to help our customers. Definitely. And I love how you… It’s very interesting that you guys are using the AI. I know that that’s one of your technological innovations. One of the things that you guys have that is unique to use is SuperCacher. I would love to hear more about the SuperCacher and what that is for people who aren’t on SiteGround? And some of the other technological innovations that you have. Sure! SuperCacher, is actually for the past two months I guess, it’s now called SG Optimizer. It’s used to work what the name suggests, highly sophisticated back-end caching system for basic PHP and any CMS out there. We had that linked for WordPress and installed with one click and came with every WordPress that we had. That would allow you to do nice things like purging cache from WordPress or to cache dynamic content or to run pages for caching and basically, it made your sites a lightning fast on a certain server with just one click. But we felt the need to upgrade it. That’s why we renamed it to SG Optimizer and now it does much more. So right now, we are always fighting against thoughts and we have that security work going on, we want to have everybody on the latest version of PHP so we added this functionality through SG Optimizer to basically trick the website against the latest PHP like 7.1 or 7.0. And if it’s compatible, it will let you switch to each version from within the WordPress back-end and then, since we were one of the first one to back this project Let’s Encrypt, you’ve heard about it? Yeah. And, we started issuing SSL for all of our clients. I think we we’re the first one to do that as well. So we added functionality to all our client to basically enable us to work in your website, to write portfolio links with just one click. People like that. People like when we build stuff like that for them. Definitely. I do remember you guys being one of the first to back up Let’s Encrypt. So you guys have really been on the forefront of innovation. Another thing is really vital to your guys success is your support team and what are the qualities that you look for when you’re hiring someone to be a team member at SiteGround? So besides being able to be a team player, which is one of the very important things for us, because none of us can create any of those on our own. So we have to be a team player. There’s only one thing that I look for and that is passion. I want to work with people who are passionate at what they do. If they are, then great things follow. I love that. When it comes to hiring technical people, same thing just people who are passionate about development and innovation? In the past few years, we’ve seen the hosting space especially around managed WordPress, changing rather drastically and we’re seeing a maturing process in the hosting space. But in your view, how was the hosting space changing and where is it moving to? Is it going closer to having cloud hosting? I understand what you’re saying, very much like the cloud. A lot of people are telling me nowadays that’s… Everything is in the cloud now. It has always been in the cloud. I thought what is a cloud? A cloud is servers that are up there that are supposed to be connected to the internet. So in my perspective, everything is in the cloud and it has been for quite some time now. And what has changed is there is more and more people liked to be catered well to get an all in one solution without the need to need to hustle to be the web developers anymore. And we, the hosting companies are not only as every service company on the internet. We’re becoming more and more of a software components rather than just plain service companies. Which I like a lot because software allows us to grow extraordinary solutions, but I think this is a big shift that will follow. Everything will be managed and the people who expects a lot more than just some space so called their websites and some PHP running. They would expect fully catered service like Oracle Base, everything done for them and whoever can adopt will survive. In your opinion, is the competition in the hosting space pushing everyone forward? I think, Amazon is pushing us all forward. They are the thing that is innovating like hell and they just change the whole industry. Not overnight but forward like 5 years. And I think that’s a good thing because without healthy competition, without good players, the industry wouldn’t move anywhere. And it has been like that from 2005 to 2010, nothing happened in our industry. Those people are all the same. It was actually boring. Yeah. Definitely. Another area that we’ve seen innovate especially in the WordPress hosting space – I know that you guys also provide hosting for Joomla and Drupal, but is around security. What kind of programs, what kind of features do you have in place to help website owners with security? It’s good that you are asking that because just today we have hosting AI security thing. That I’m going to tell you in a minute. But I, myself and a lot of other people in our team, we’ve always been obsessed with security, like obsessed to the point that if we go towards the hall of our office and some computers are locked, I would go and change the background – or something stupid just to make the person know that they have to lock their desktops all the time. And we deal with our clients the same way we kind of push them towards having more secure websites and build solutions for them that would allow them do not get hacked even if they don’t do all those creative repulsions that they have to. So we have to push them to use SSH without passwords but with only a key, stuff like that. And of course, we have those DDoS mitigation devices. We mitigate some web attacks. We have our own custom web application firewall that we are, I think 2-3 rules a day at least. We have a 24/7 security team. We have more than hundred kernel patches I guess. So a lot of those have gone up straight to the kernel itself and a lot of other competitors are using those. And we have our own security container technology which allows to basically isolate an older instances that we run. Just today we launch this AI thing that would gather all the logs from all our servers in one place and that’s tens to thousands of servers. And that’s a really big data problem that we have to solve to, try to analyze all those logs real time and to block malicious content, of malicious traffic. And separating legitimate traffic from malicious, is an extremely difficult task, especially when it involves hundreds of thousands of sites and people get angry if you block their customers for all the obvious reasons. So you have to make it so that you don’t block anybody at that instance. So they’re numerous solutions that move around the internet like massive list of user agents to ban or database, attacking IPs to block but none of that really works. Before launching our servers, we have to reroute traffic to security providers, which added additional hops to the networker for months and was more expensive for our customers and that’s why we built that solution, we just launched today actually, which has been live for about 6 hours and has blocked on average 2 million log-in requests per hour. Wow! I think that a lot of people don’t realize how massive the automated attacks are. It’s good to see that you guys and other people are innovating in a way to detect those. I think people just an hour starting to see it because automated attacks are getting so big that people actually, it’s a weak, weak as a shared hosts. We have limits on our plans and people started seeing their [traffic] limits just because their site, gets a lot of bot traffic. And you can’t really, if you have an AI system that will differentiate those traffic because it’s legitimate traffic. That’s true. That is a huge problem, just making sure of it. It is really hard to separate legit traffic from illegitimate traffic. One question I want to ask you is…And I don’t know if you guys were partnered that before. But recently, Sucuri was bought by GoDaddy. We’re seeing a lot more consolidation in the space. Hosting companies buying up, acquiring different things. Are there any things that you guys have thought about – or is on your road map for either developing or acquiring? Both actually. There is. Unfortunately, I can’t talk more about all of them but as there’s sort of things on the road map that we’d like to acquire and there’s certain things that we’re already building. So hopefully you’ll see 2 or three big launches from us us – which will be at the end of the year but we’re talking something very, very big. Oh coll. We’ll be looking out for that for sure. And I want to ask you too, you guys have a lot of different offerings, you guys hosting for a lot of different CMS. When it comes to a customer profile, who are you really targeting right now? Who are your ideal customers? We’ve always been kind of very popular in the small and personal business website segment, which generally means we’ve done the harder work to please each and every client. But this has actually started to shift towards bigger and more enterprise-like plans in the last years. And it started naturally, we just recently launched the custom enterprise offering that is aimed at bigger and more complicated projects, which we built from scratch for our clients. And we’ve got a fair amount of authentic number clients already. I think because our name is out there and people trust us and more or less because we are able to build everything because we have such a secure, developed SSL domain. They basically do magic. So yeah, I think that’s that. We used to be the same to the small business owners and now it’s towards I guess everybody. When it comes to the marketing efforts, how is that different when you’re approaching an enterprise customer as opposed to a small business? Oh well, it’s very, very different. Small business, they’re sending through our websites. They buy themselves the whole suite package. 80 or 90% of them we never hear from. They do everything themselves. A lot of them they don’t require any support because we have a lot of resources and a lot of stuff they can do their own. The enterprise sale. The sale itself is much, much longer process and sometimes its months. It’s not just something that happens on your website and then after you have closed the plans, you have to build the solution for him. So it’s not something that we allow. It’s different every time even if it’s smaller. It’s different. It’s so different. So the marketing efforts in that regard were different as well. So we had to create a name for ourselves in the enterprise world. We have to start working with agents, also with agencies which is a great thing because those guys had some great feedback for us. Everything is different. It’s a completely different story. I like it. Definitely. I think when you’re dealing with small businesses, there’s a pre-package offering. What you’re describing is when you have an enterprise client, you have to really dig in and understand what their specific needs are before you’re going building them a custom hosting solutions, is that basically right? Yes, yes, and all of them require different support, different level of support, and different channels of support. It’s a different thing and I’m glad we started doing it because it showed me how are different hosting prepare. When it comes to the WordPress community in specific, SiteGround has really been heavily involved. You’re one of the recommended hosting providers on the WordPress.org page and overtime marketing for hosting companies and product companies and all sorts in WordPress spaces started to change, but you’ve been heavily involved. How has that benefited the company’s growth and how is marketing changing for WordPress companies like yours? We’ve been involved with WordPress for quite some time now. I think, first we started building themes for our clients and that was probably, I don’t know, 10 years ago? And then, we started doing tutorials. Still when I go to conferences, I meet people that tell me how great our tutorials were, 8-9 years ago and how many people use them. And then we discovered WordCamps! We started going to WordCamps around the world, started sponsoring, started getting involved, started becoming part of the community. WordPress itself has grown a lot in that time. So naturally, every company that is focused on providing for its services to meet the growing WordPress demand can see the positive effect that we’re growing. It has become a serious factor on the internets. 30% of the internet is WordPress, but I put the stress on quality. I doubt we wouldn’t have been where we are if it weren’t for all the hard work we put into our services and for all the efforts we make to optimize our frame and to make it work with WordPress users easier. The marketing part, you can easily see a shift towards agencies, as I said, and bigger and more complicated web projects. And that’s largely thanks to the development of WordPress’ very powerful platform for basically everybody, but enabling designers and developers to make wonders in a much shorter time was a great thing. If you bear with just our web host, knows what they’re doing and knows the possibilities of software world and you can rely on the webhost to optimize your projection cycle, then you’d be a happy client. I think WordPress has helped us a lot and we’re trying to contribute back as much as we can. Definitely. In all the different major hosting companies in the WordPress space, they each kind of have a distinct- either target audience or personality, or just the way that I think of them is totally different. But when it comes to SiteGround, how do you ideally want people to perceive SiteGround as a hosting option? You mean what do I want people to think when the brand SiteGround is mentioned? Or what’s the word that comes to mind? Was that your question? I think we should go for a break and come back and ask some more questions, John. How does that sound? Okay, yeah, we’ll go for a break. Okay and when we come back, we’ll be talking more with Tenko Nikolov of SiteGround. See you in a minute. And we’re coming back from our break! We’re talking with Tenko Nikolov of SiteGround. Another project that you’re involved in is- I don’t know if I’m saying this right- but Kyup? Describe what this is, who is this actually targeted at? The name is actually said as, Kyup, and in Bulgarian, it basically means a “container”. Kyup was built as a brand that basically showcases SiteGround containers folder something that we’ve heavily invested 3 years ago. Kyup is now basically the front of SiteGround-powered container technology that we sell and managed without all the goodies that you get at SiteGround, and cheaper. And currently powers more than 10,000 of containers and there’s a lot of people using it. It’s a big brand. We’re slowly thinking about making Kyup our enterprise front like delivering the platform because it already does. It’s already in the platform for our range of client plans, but we’ll see how this goes. Can I ask a quick question, John? I just wondered, you talked about Amazon being one of the main drivers and innovation in the hosting industry in the past 5 years, do you think Amazon or Google or even Microsoft they might actually into the hosting business directly? No, they’re too big and support is the problem. Unless they can have thousands and tens of thousands of support engineers who are being able to tackle with that, no, I don’t see them entering our market. I see them as technology innovators which drive the space upwards, but I don’t see an immediate threat. Definitely. Where do you see the hosting market itself going over the next decade? And where do you see SiteGround fitting in to the hosting market? I see, as I told you before, hosting companies are becoming much more software companies rather than service companies. I see the big role of AI will have in that. I see a lot of software service offerings rather than plain features. I think that’s that. Very good! Are there any other projects that you’re involved with that we don’t already know about? In my free time, me and my partner, we act as angel investors. We have couple of investments maybe in I-Tech companies. One is doing software-defined storage and the other is doing crowd-sourcing of skiing and snowboarding instructors in the Alps. We’re just about to sign in another investment into a company that will do AI chat bots for stores, so web stores would be able to get AI chat bots. (I’m sorry about that somebody rang the bell.) I’m involved in other companies as well, although not as much, but still. Can I ask additional question? Obviously SiteGround, you’re based in Bulgaria, my knowledge of Bulgaria is that its university structure is high. It got some fantastic tentacle of colleges and universities, has that been a major factor that helps SiteGround grow in being so successful? This is a very, very good question. Thank you for it. Yeah, it has, although it’s not the universities. What is great about Bulgaria it’s the technical town that we have despite the lack of good universities. Here in Europe, Bulgaria has been called a lot of times the “Silicon Valley of Europe”. We have lots of very good talent. For some people, Bulgaria is a small country, we are just 6 and a half million people. Lots of people, as a percentage doesn’t mean that much in total, but still we were able to find the best engineers out there and it had the major role in our growth, yes. I’m interested in you saying that it’s not because of the university, so what are some of the factors that have led to that pool of talent then? I think we are one of the country that has the biggest internet penetration, and we’re among the top 3 in terms of internet speed in the world. All those things are true because people are passionate about technology here in Bulgaria. All those engineers that we have, most of them are self-taught, self-motivated. That’s the thing about Bulgarians. We’re very, very self-motivated. I guess, that’s the main reason. But nowadays, we have employees all over the world. It’s not only Bulgaria. So would you oversee as, because the size of your company now, but would you suggest that anybody looking for good advice to look at Bulgaria? Yeah, I think so. I want to but I think so. I know it is extremely in your opinion. Bulgaria got one of the oldies cultures in Europe. I think I am correct about that, wouldn’t I? Yes. Yes. Bulgaria was founded in 681 AD. And that was much before a lot of countries in Europe. So Bulgaria is an ancient nation. Britain didn’t exist but at least of 400 years. So what are the main things that SiteGround want to achieve in the next 12 months in the WordPress community or in general? What is your number one objective in the next 12 months for the company? So we’re building this and I don’t think we already talked anybody about this. We are completely this new completely new user area portal for our clients, which would incorporate a lot of new technologies, a lot of new processes and a lot of things I think would help our clients be better at what they do. And it is a big thing for us because it is going to be mobile, it is going to be fantastic I hope. And that is something that we’ve been working on for quite some time now. And I think it will be ready by the end of the year. So we in the next 12 months. And another thing that I hope to complete within the next 12 months is we are building our very own building. So our own office. It is a pretty sizeable thing. Is it going to compete to the Apple offices? I hope so. Yes. I certainly hope so. It’s been set to be the most technologically advanced building in Bulgaria. And hopefully, the name will speak for itself. So that is the big thing for the next 12 months. Another fact, you obviously, you’re big in data centers, energy, they require a lot of fuel in to produce heat. So what is the company’s plans when it comes to renewable energy resources? Is that something you are looking at to keep your cost down? Obviously, we pay our data centers and they paid our electricity companies so it is not a direct cost to us. But lately, it is more and more clients coming to us with the same question. So we’ve got a call with Green Peace. They wanted to get basically cloud servers but they wanted to get it from a company that is curious about the environment. So we have to go to a lot of our data center providers and ask them for very, very nasty questions and make them commit to some things that they would do in that regard. And I am hoping this would stay on for the future. Moreover, we are investing as I said in Linux container technology, which basically allows us to increase the density of Linux noles we can put in our servers, sort of that is a technology like VMware, let’s you many, many containers on one server. So basically, having more of those containers into one single server. Save those serves and it is by the hundreds. So we are trying to be more and more eco-friendly in that regard. And one more question and I will hand it back to John. In general, do you think WordPress is less secure than some other open CMSs or do you think each just has its own design and it is misunderstood in some ways? To be honest, I think WordPress is more secure than the majority of it. And I think that WordPress genius is doing more than most of the other open source project and because we work with them and we work with other open source projects, I can really say that from the bottom of my heart. Because WordPress is so big, it gets a bigger portion of the attacks. Hence, the perception it is less secure. But I think it is not. I think it is honestly not. I think that is fantastic news. Back to you John. Maybe you got couple of questions. Basically is there, when it comes to marketing over the next year, what sort of initiatives is SiteGround targeting for marketing in the next year? So besides we are launching the new things that I mentioned earlier, which I can’t really talk about, we plan to make a big thing about the AI stuff that we are working on. We were aiming at building our first AI vaults that would be able to get inquiries for customers and help them much faster than our employees can. So the idea for that is not to fire people. It is our first line of support. That would be immediate and would still be very, very knowledgeable things to all the resources that we have. And to be honest, in that past, we’ve always relied on innovation to be something that we tell people about. It is part of our story. So I think not only in the 12 months to come, but in the years to come, it is going to be innovation that we are going to talk about. So we will still go to events, we will still be part of all the committee that we’re part of. I will still organize conferences. I will still do all those things that we do, the traditional marketing. But we’ll try to innovate and to tell people about it. Something you said in that last answer, it just made me think of something as well. We’ve seen a lot of conferences that are not WordCamps but there are various other ones – like all PressNomics, LoopConf – all these different ones. At some point in the future, could you see SiteGround either hosting or organizing some sort of conference around innovation or technology or hosting? We actually do. First of all, we were a big part of organizing WordCamp Europe when it was in Sofia, and we’re a big part of organizing WordCamps here every year. But when it comes to our own conference, we’ve been doing this Bulgaria PHP event, which gathers more than I think 800 people from all over the world with very good people talking. And we’ve been doing that for quite some time now. I think two years we’ll probably do it again next year. And yeah, I think we can organize more events in the future. We’ve been talking with agencies and other people that are organizing conferences because this is something that we think we’re good at. And we can definitely help and organize some more events. Definitely that is for sure. With that, I think we’re at the conclusion of our episode. And we’d love to have you back sometime in the future. But how do people get a hold you Tenko and is there anything that you’d like to promote? No. I might get promotion so no. But if somebody wants, they can tweet at me. It is @tnikolov. I am pretty responsive and that is that. I’d love to come back in the future. And thank you. Definitely. And Jonathan how do we get hold of you? Anything that you want to promote? Just want to say it’s been a really fascinating to interview Tenko. Thank you so much for coming on this show. I know you are busy oversee some of the managers of the company. With the size of SiteGround, time is a precious factor. But I think we’ve given some really insight into SiteGround, the kind of company it is and its plans. How to get hold of me? Very similar to Tenko. I am normally around Twitter @jonathandenwood. You can email me. If you got any questions or you need some advice, email me directly, I’ll get back to in 2-3 days and that is at [email protected]. Excellent. And you can get hold of me at my website, which is LockedownDesign.com or you can follow me on Twitter Lockedown_. For the WP-Tonic podcast, we’re saying peace out and get your dose.